Bus from Alor Setar to Johor Bahru is still the preferred mode of transport for local passengers to travel from Alor Setar to Johor Bahru. That is because bus from Alor Setar to Johor Bahru is the most convenient way as compared to flight and train services. Why Take the Bus from Alor Setar to Johor Bahru? The main reason of taking bus is budget and airline ticket fare usually much more expensive than bus ticket fare. You may get cheaper air ticket with fare similar with the bus ticket fare only if you make flight ticket booking during promotion period. Another reason of taking bus instead of train is because there is no direct train service for this route. Passengers have to transfer train from KL Sentral and Gemas station to JB Sentral. Thus, bus is still the most convenient and easiest way to go Johor Bahru from Alor Setar. S&S International Express, Antar Holiday Express and Sri Maju Express are few bus operators operating bus service from Alor Setar to Johor Bahru. Please note there is only evening session available for this route service. The earliest bus service is starts from 8:00pm. The following schedules are 8:15pm, 9:00pm, 9:30pm, 9:45pm and 10:15pm. Duration required for bus from Alor Setar to Johor Bahru usually takes 10.5 hours on average. At least one washroom break will be given during the journey. Additional toilet break will be given upon request from the driver when on a long journey. The bus fare is priced reasonably in a range of RM 77.00 to RM 85.40 depending on your choice of bus operator. The pick up point in Alor Setar will located at Alor Setar Bus Terminal while the drop off point in Johor Bahru will be located at Larkin Bus Terminal. Passengers arriving at Larkin Bus Terminal can take public bus or taxi to their next destination. 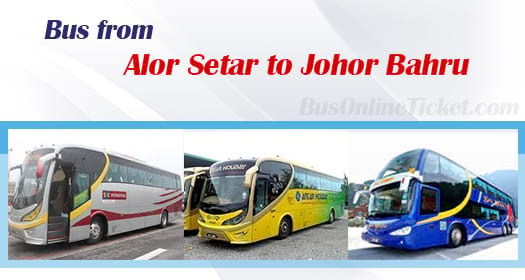 Everyone can book their bus ticket online from Alor Setar to Johor Bahru via BusOnlineTicket.com now. Passengers are advised to book their bus ticket in advance to avoid disappointment especially during weekend or holiday season. You can make your booking anywhere, anyplace, and anytime and it will be confirmed instantly upon payment is made.